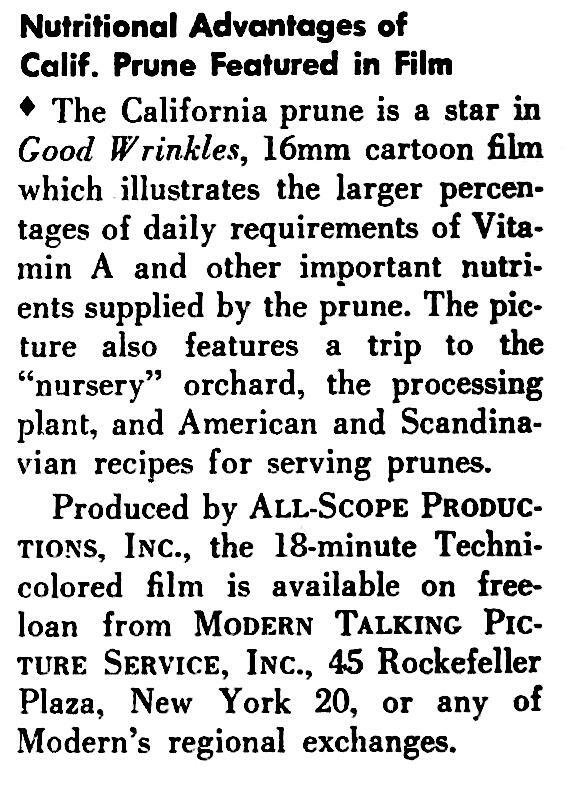 One of the more interesting curios in the subject of sponsored animated cartoons is a 1951 film that was commissioned by Sunsweet Growers (The California Prune & Apricot Growers Association) and produced by All-Scope Pictures entitled Good Wrinkles. 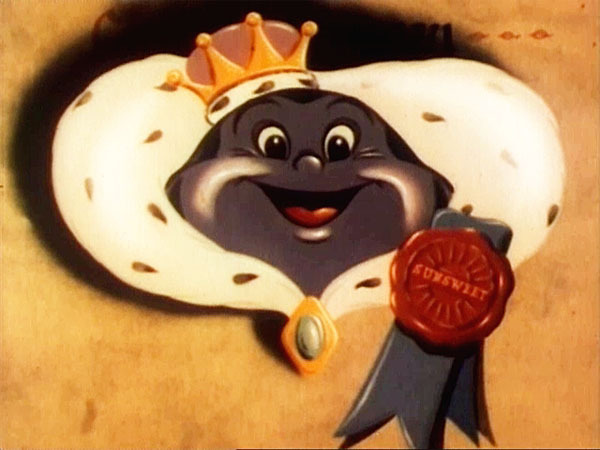 The twenty-two minute Technicolor cartoon, which was narrated by well known radio personality John Nesbitt, was created with the intent on educating viewers on Prunes and also introducing a mascot cartoon character for Sunsweet. 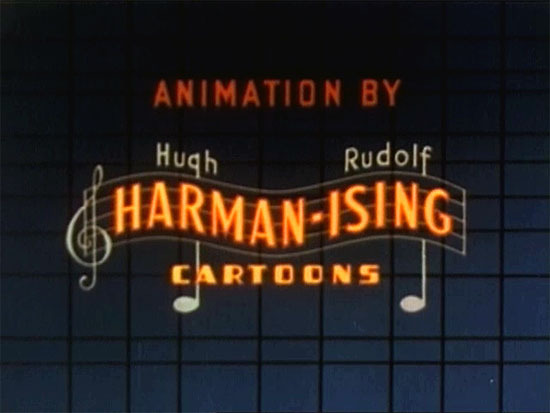 Though the cartoon has been relatively forgotten by many today, it is known by a few animation historians and enthusiasts for being made by cartoonists Hugh Harman and Rudolf Ising, long after their careers with both the Warner Brothers and M-G-M Cartoon studios were over. As a matter of fact it’s one of the few films produced by both Hugh Harman and Rudolf Ising together following the reformation of their partnership in 1946, eight years after it’s dissolve in 1938. 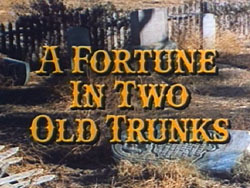 “Good Wrinkles” was a follow up to an extremely successful live-action documentary film that was also commissioned by Sunsweet and made by All-Scope Pictures in 1947, entitled A Fortune In Two Old Trunks. This twenty-two minute film chronicled the history of Prune growing in California with Louis Pellier and highlighted how Sunsweet has built upon these roots and improved Prune growing into the post-World War II era. The film was only distributed non-theatrically by Modern Talking Picture Service and was exhibited at community club meetings and in schools; for school screenings, Children in attendance were issued souvenir comic book adaptions of the film. Different trade magazines spoke highly of the documentary, and it also received a number of awards from various different organizations; amongst one was being selected by the Office of Information and Cultural Exchange of the United States Department of State, in which it was translated into 26 different languages and exhibited around the world. The success of A Fortune In Two Old Trunks prompted Sunsweet and All-Scope to work together again, only this time take on a more ambitious project in making an animated cartoon that would not only educate viewers about Prunes, but also be used to introduce a mascot character for Sunsweet’s Prune brand. However All-Scope Pictures was incapable of making an animated film to the degree that Sunsweet was interested in, as they were a very small production company and was without an animation department or a music department. 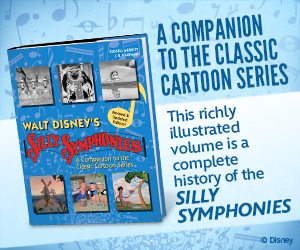 All of the music that was featured in their Sunsweet films was library music from the Capitol Records Hi-Q Library. 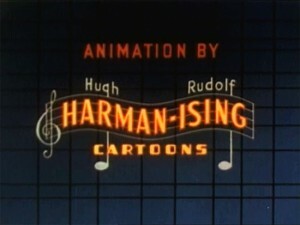 To make the cartoon, All-Scope contracted Harman & Ising Cartoons. The end result was a twenty-two minute animated cartoon entitled Good Wrinkles that ambitiously set out to introduce Sunsweet’s new mascot, Sunny Sweet the Prune. To introduce Sunny Sweet and also educate viewers on the uniqueness of Prunes, Hugh Harman and Rudolf Ising cleverly utilized the Hollywood rags to riches theme in which the life of a Prune was compared to that of a movie star. As indicated in the film ‘all Prunes are Plums but not all Plums are Prunes’, similar to the concept of how all movie stars are people but not all people are movie stars. As a result, there is a lot of Hollywood themed nostalgia throughout the film. Sunny Sweet stops for a photo during his grand premiere at the Grauman’s Chinese Theatre. One of the highlights of the cartoon is the very beginning that spoofs a grand opening premiere at the Grauman’s Chinese Theatre. While it’s fun (for theatre and film buffs) to see the appearance of the theatre, the true highlight of this sequence is the caricature presence of the film’s narrator John Nesbitt. Nesbitt who was a radio commentator and narrator for short documentary films (most notably his M-G-M “John Nesbitt’s Passing Parade” short subjects), rarely made any on-screen appearances let alone appeared as an animated caricature. 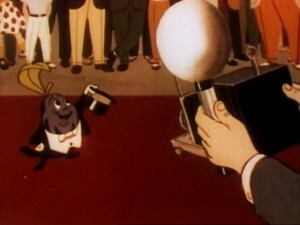 “Good Wrinkles” is the only animated cartoon that features an animated caricature of Nesbitt giving him a rare on-screen appearance. John Nesbitt makes a rare animated cameo appearance in “Good Wrinkles”. Amongst some of the other Hollywood related highlights of “Good Wrinkles” consist of shots featuring cartoon renditions of filmmaking equipment, and light humored Hollywood related jokes (i.e. ‘Cecile B. De Prune’). Aside from the Hollywood related material, other notable content consist of the animated Prune production factory sequence which effectively breaks down and visualizes the production process in cartoon form. 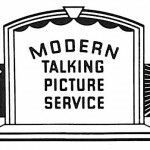 The logo for Modern Talking Picture Service, Inc. 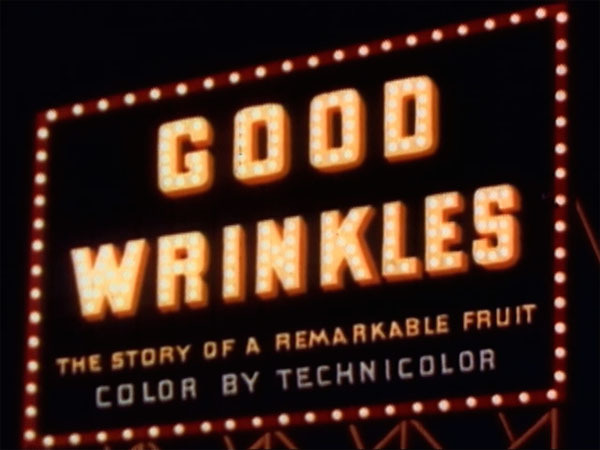 Despite the heavy Hollywood movie theme in “Good Wrinkles”, the film was not exhibited in movie theaters. Like it’s predocessor “A Fortune In Two Old Trunks”, “Good Wrinkles” was distributed non-theatrically by Modern Talking Picture Service, and was exhibited in schools and at community club meetings. For Distribution, a merchant who sold Sunsweet Prunes was loaned a 16mm print of the film from Modern Talking Picture Service. That individual/store would then arrange for screenings within their community at schools and also at community club meetings. For screenings in venues that were without projection equipment, Modern Talking Picture Service would supply equipment and licensed projectionists to exhibit the film. 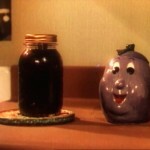 A Sunny Sweet Prune jar, as seen during the live action sequences in “Good Wrinkles”. To further boost Sunny Sweet’s image, Sunsweet also commissioned a wide variety of merchandise to accompany the cartoon. Amongst one of the more fascinating pieces of merchandise is a Sunny Sweet stuffed toy that was produced by the R. Dakin & Co. Toy Company around the same time of the film’s production. These toys contained a little tag on it which gave the owners a brief run down on the health benefits of Prunes. 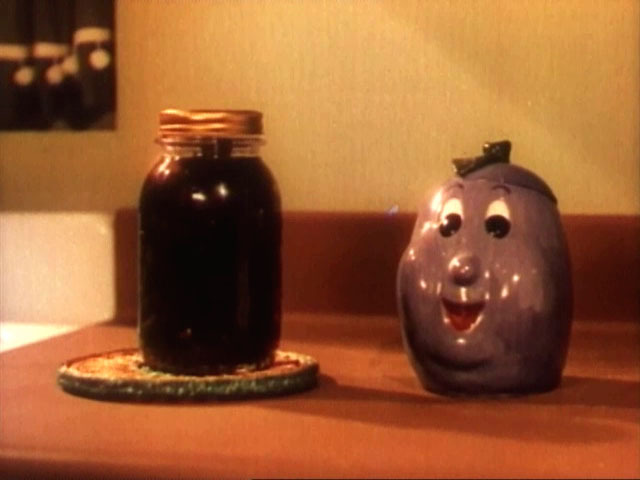 One other known piece of merchandise, which can be seen in the live action sequence of the film, were Sunny Sweet prune jars. In addition, as was done with “A Fortune In Two Old Trunks”, it’s possible that Sunsweet also commissioned a comic book adaption of “Good Wrinkles” that was either sold and/or handed out to children at school screenings of the film. 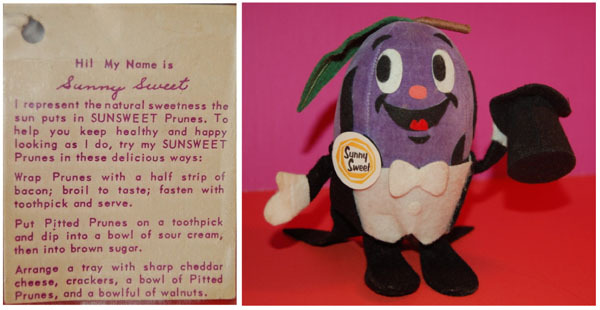 The stuffed toy, and tag, of Sunny Sweet the Prune that was created by the R. Dakin & Co. Toy Company. These two images come from the Allee Willis Museum of Kitsch. Currently it’s not known how well the character or the film performed with audiences. Sunsweet, certainly went out of their way to market the character as can be seen with the Sunny Prune merchandise. However while going through old trade magazines, certain observations hint that the cartoon may not have been as successful as it’s live action predecessor. Perhaps the most striking observation that suggests this is by comparing Business Screen Magazine’s articles for “Good Wrinkles” and “A Fortune In Two Old Trunks” together. The original trade article and review that ran in the 1947 Vol. 8 No. 8 issue of Business Screen Magazine for “A Fortune In Two Old Trunks” was an extremely positive review that spoke highly of the production; the review itself takes up about a third of a page. The review of the “Good Wrinkles” which appeared in the 1953 Vol. 14 No. 1 issue of Business Screen Magazine. In addition, up until 1951 the film would be mentioned occasionally in the magazine for receiving awards and honors. In terms of Business Screen Magazine’s article for “Good Wrinkles”, it was dramatically different. The first and only article of the film which appeared in the 1953 Vol. 14 No. 1 issue, published two years after the film’s completion, only accompanied a small sixth of the page and did not really sing any praises of it. While it certainly was not a negative review, it was nowhere near as exciting and was rather basic when compared to the magazine’s review of “A Fortune In Two Old Trunks”. Interestingly it doesn’t even mention Sunny Sweet by name and instead simply refers to him as a ‘California Prune’; in no way does it go out of it’s way to sell Sunny Sweet. To add to these observations pertaining to Business Screen Magazine, “Good Wrinkles” never received mentions of receiving awards or honors in the magazine either. While it’s possible that the film did not do as well as anticipated, it’s also possible that it did go over well with audiences and just got overlooked for whatever reason. Unfortunately due to the limited amount of information available on the production itself and on All-Scope pictures, we may never know. Regardless, today “Good Wrinkles” is still a fun piece of history that offers modern day viewers a look at the Post-WWII era work of both Hugh Harman and Rudolf Ising. The film is available from the Prelinger Archives for both viewing and downloading from the courtesy of Rick Prelinger. Six or seven Prunes a day are good for you in every way! Eat Sunsweet Prunes and you’ll agree, cooked or raw they’re heavenly! 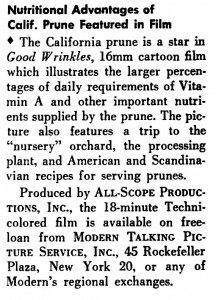 Yeah, I can see where the “Six or seven prunes a day….” line might lose an audience full of kids at the one-minute mark of the cartoon. They might have tuned it out right there, which would explain why it wasn’t successful. As ambitious as Hugh Harman was to keep up with Disney in the 1930s and 40s, he had to have chaffed under the cost-cutting requirements the industrial animation budgets of the 1950s required. Capitol Hi-Q didn’t exist until 1956 so that isn’t where the background music in this two-reeler came from. Some of the arrangements remind me of Eugene Poddany’s work; the muted trumpets at the start are similar to what Jack Shaindlin arranged in his Langlois library. Am enjoying these industrial film posts immensely! Think you could do this as a possible regular feature? I’d love have a regular weekly column on industrial/commercial/educational animated films here. As information on them is harder to research than standard entertainment cartoons, it takes our experts a little longer to compile such posts, making them appear less frequently. Rest assured its one of the goals of this site to spotlight these neglected productions. As for Thunderbean Thursday, Steve Stanchfield has been unexpectedly detained with a combination of work, play and personal matters over the last few weeks. Spoke with Steve last night and I quote, “TB Thursday will return with a vengeance next week”. Great post. So, is John Nesbitt the narrator of any of the MGM cartoons, like “LITTLE CAESARIO” or “BARNEY BEAR’S VICTORY GARDEN” or even “ROOKIE BEAR”? Just wondering. I defer to Keith Scott, but I believe that’s Gayne Whitman in the Barney Bear cartoons cited above. I see some lucky buyer paid $125 for this. I hope whoever bought it is going to provide us with a nice new transfer someday (preferably HD). 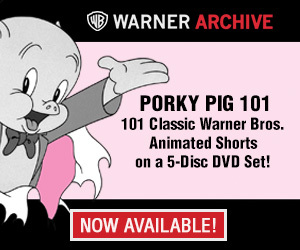 I like to imagine that “Good Wrinkles” is what the Warner Bros. cartoons would have looked like by the 1950s had Harman and Ising never left for MGM. Seems like the California Prune is sort of an ancestor to the California Raisins. By the way, Sunsweet later hired Stan Freberg to do TV commercials for them. 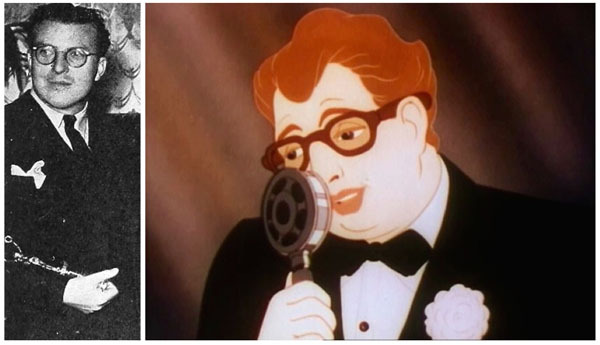 Interesting, the animated presence of John Nesbitt – I’ve seen several of the MGM “Passing Parade” shorts when they ran as filler on TNT and TCM. One favorite is “People on Paper,” a look at comic strip artists and their famous creators. Jerry and Kevin, no that’s not Gayne Whitman narrating those and other MGM titles, but a fine radio announcer named Franklin Bingman. He also narrated a few 1940-41 Columbias (like FARMER TOM THUMB and THE LAND OF FUN). I can certainly tell he and John Nesbitt have a similar vocal quality. I wonder if any of the uncredited animators on this film were Harman and Ising animators from their Warner Brothers and MGM days?